Tips for a cozy night in watching the results. Tomorrow’s a pretty big deal here in the US. If you’ve already voted, YOU’RE AWESOME THANK YOU. If not, the first thing you have to do tomorrow is get out there and vote. After that, it’s time for damage control. Here’s our guide to watching the results tomorrow. Step 1: Check how much whiskey you have. Do you have whiskey? What about gin? You might need some gin. Did you know pot is legal in Massachusetts now? Awesome. Things to know. Get some cocktail sausages for snacking later, maybe some candles. Candlelight is pretty relaxing, right? You got this. Step 2: Check what time it is. Is it 6pm Eastern? That’s when polls start to close. They don’t close in Alaska until 1am Eastern, so don’t think you’re going to know how this all goes by the end of the day. You won’t. Manage your expectations. Be cool. Step 3: Let me guess: it’s only 2 in the afternoon. Have you considered buying a pizza? Go buy a pizza. Treat yourself. Have some friends over. They’re probably feeling the same way you are. A little on edge, a little anxious. Get together. Togetherness is a good thing. Step 4: Do you like board games? I love board games. If you don’t have any board games, you’ve still got time. Go buy a board game. What you’re looking for is something that takes at least an hour or two and that’s complicated enough that you’ll want to play it a couple of times to really get it right. I like Scythe and Brass. Elle suggests Dominion, Dixit, and Race For the Galaxy if you’re looking for escapism. Pandemic or Dead of Winter if you just want to feel aware that you’re rearranging deck chairs on the Titanic. That’ll kill some time. Yeah. Step 5: Don’t check the exit polls. Don’t turn on the TV. Don’t do it. Don’t. I see you thinking about it. Leave your computer closed. Unplug the router. Accidentally drop yours and all your friends phones into a box than can only be opened once every 24 hours. Failing that, remember the whiskey? You can do this. Step 6: Check the time again. Oh god it’s only 5? The first polls don’t even close for an hour. Are you trapped in a fold in spacetime? Is it Groundhog Day? Have you done this before? How much whiskey is left? Unplug all the clocks in the apartment. Step 7: Enlist your friends in the fun activity of lining a room with tin foil. You knew there was a reason you bought sixty-seven rolls of it when you went out shopping last week, didn’t you? Be Prepared. That’s the Boy Scout Way. You can get through this. In addition to killing a little more time, it’ll keep the y-rays out of your room and make it way easier to keep free of New World Order mind control techniques. Remember to stretch. Step 8: Check your friends’ watches. Realize that it’s 2018 and nobody even wears watches anymore except Steve, who’s got one of those fitness trackers that happens to also tell the time. According to Steve, it’s only 6pm. How did that tinfoil thing only take an hour? Whisper to your friends about how suspicious this makes you all about Steve. Without looking at your phones you have only one timepiece. Consider taking it from Steve. Step 9: It’s dark. Thanks to daylight savings time ending the sun has been down for over an hour or more now. The last light of the day star has faded from the horizon. The descent into madness had felt more upsetting in the cold light of day, but here in the night it feels comfortable. Right. Consider heating up those cocktail sausages. Step 9: Arrange the candles in a circle the way the elders taught you. Sal knows the ritual, too, so she’s the most useful by far. She’ll have a place of honour in the coming times. Is there any whiskey left? Are we on to the gin? Well, gin’s fine, too. And anyway, the question isn’t so much what you’ll be drinking, is it? It’s what They’ll be drinking. When They arrive. Step 10: Prepare the sacrifice. It doesn’t really matter who it is. Maybe it’s Steve. Maybe none of you have names anymore, or you won’t soon anyway. No one will have names in the time after the Coming. All will be Well. Step 11: Everything is set. The candles are lit. The bottles are empty and the words that have been whispered into the void have begun to whisper back. Steve’s watch reads midnight. It is time. Lift the long knife and watch it shine in the candlelight. Stare into the eyes of your friends one last time. Step 12: Check the results. 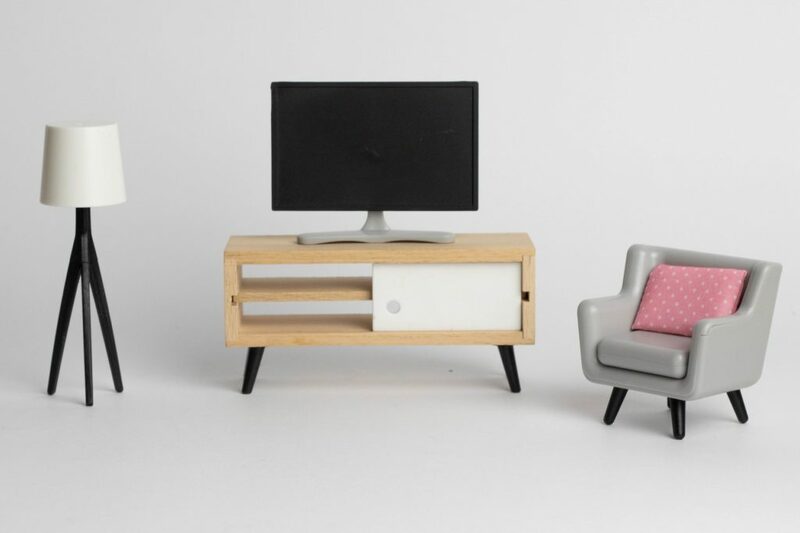 Image is of a cozy little TV, table, lamp, and chair, and is by Marco Verch and released under a CC-BY-2.0 license.